If every villain is the hero of his own story, is every hero the villain of someone else’s story? In Eli, Victor recognized a shared darkness. The college roommates started working together, researching into the origins of extraordinary abilities. A clear pattern emerges: supernatural abilities develop after near death experiences. From theory, it’s a short jump to experimentation, with Victor and Eli setting out to give themselves powers. These experiments give them powers, but they also lead to death and betrayal. Victor has spent the last ten years in jail, plotting his revenge. Now, he’s broken out and is ready to put his plans into motion. Eli considers himself a hero; chosen by God to eliminate all those with superpowers, barring himself of course. Victor wants to take him out, but he sees himself more as a villain than a hero, musingly comparing himself to Magneto. While the battle between the two dominates the book, others are drawn into their lives, primarily two sisters: Serena and Sydney, whose complicated (perhaps this is an understatement) relationship mirrors Eli and Victor’s. None of the characters are fully heroic (perhaps Sydney comes the closest), but even the ones who embrace their own monstrosity aren’t always as inhuman as they believe. While Eli and Victor are focused on their own goals, they both have people around them. They might not acknowledge caring for others, but they both do in their own way. That said, I think Victor (for all his embrace of villainy) is perhaps the less twisted of the two. I love the grey zones and complications Schwab plays with here. However, the greatest strength of Vicious lies in the pacing. It’s amazingly fast and gripping. It’s one of those books I was unable to put down. In fact, I ended up reading all of it in a single day. Unfortunately, Vicious isn’t without its flaws. I was sort of bothered by the treatment of the female characters. While both Sydney and Selena are important, it ultimately is still a battle between two men with dead women left on the sidelines. There’s at least one woman who was clearly fridged, and another for whom it is arguable. This isn’t the first time I’ve had trouble with Schwab’s female characters, so I’ll have to keep an eye on it in the sequel. And yes, I still plan to read the sequel. Even if I had criticisms, the story managed to sweep me away. P.S. Yes, I know Schwab has said on Twitter that Victor is ace and that the ace community has concerns with that possibly falling into problematic stereotypes. No, I didn’t address it here, primarily since it’s not actually in the narrative. I’ve heard it will be made textual in the sequel, so I will discuss it in my review of that book. Hmm, sounds like another book of Schwab’s that I might feel ambivalent about after reading. I’ve read ADSOM and This Savage Song because I thought they had great premises but found them both missing something in the end. Your comment about Victor possibly being ace (and problematic) has me even more curious about this one! The whole “Victor is ace” thing is something she said on Twitter. I don’t know how much it’s really in the book. Yeah, I haven’t found any work of Schwab’s that I’ve really fallen for. I always seem to like parts but to not be overawed by the whole. Sheesh, I’ve had more than one near death experience – where are my superpowers? OK, now I’ve got that whinge out of the way. I applaud these reviews. At least I am forewarned if female characters are there more for showcasing male characters, than as part of the story. The plot and pacing sound interesting, perhaps I will read, and then present my thoughts to the author, I have found most authors to be very interested in the reader’s POV. I think reader/author interactions depend a lot on the people in question. I know some authors prefer not to read reviews. I guess I should’ve elaborated a little. The very new authors I have contacted have been very approachable – pleased to know someone has actually read their book. You are correct, reviews are fraught, even for the very successful. Maybe Schwab is open to discussion of females and stereotypes, maybe not. 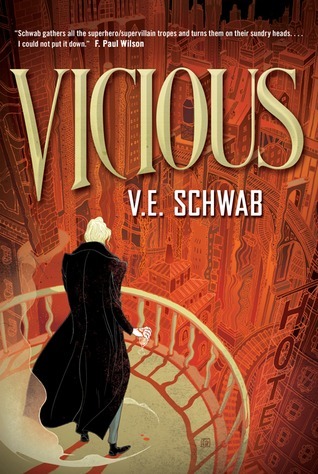 I will read Vicious, and if I enjoy the plot, might write to him. No promises, but. However, I will keep reading your reviews.